Megabat is the common name for any of the largely herbivorous Old World bats comprising the suborder Megachiroptera of the order Chiroptera (bats), characterized by true wings and flight (as with all bats), large and prominent eyes, claws generally on the second digits supporting the wings, and an excellent sense of smell. Echolocation is almost unknown among the megabats, while it is prominent in the other major division of bats, the microbats, comprising the suborder Microchiroptera. 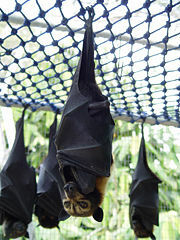 Extant megabats are placed in one family, Pteropodidae, which has about 170 species. These species are found in Africa, Asia, and Oceania. 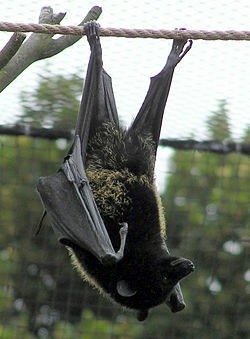 Megabats primarily feed on fruit, nectar, or pollen. These flying mammals are also referred to as fruit bats, old world fruit bats, or flying foxes, or more specifically as Megachiropteran fruit bats. Many of the megabat nectarivores are important for pollination of flowering plants, transfer pollen as they feed on the nectar of plants. Other megabats are important for plants as agents of seed dispersal. For humans, the large size, large eyes, and somewhat "spectral appearance" of the megabats has led to their sometimes being portrayed in horror movies to represent vampires or to otherwise lend an aura of spookiness. In reality, the bats of this group are almost exclusively herbivorous creatures and pose no direct threat to human beings, baby cows, or ill children. Typically, bats, which comprise the mammalian order Chiroptera, are divided into two distinct groups that generally are given the rank of suborders: Megachiroptera, or megabats, and Microchiroptera, or microbats. These two groups may not represent monophyletic lineages, but taxonomies generally reflect this division (Wund and Myers 2005). The names imply that megabats are larger than microbats, but this is true only in a general sense, as some megabat species are smaller than some microbat species. There are, however, several consistent differences between these two groups. Among the differences between megabats and microbats is the fact that the latter use echolocation, whereas megabats generally do not (except for Rousettus and relatives, which use a simple, unrelated form of echolocation); microbats lack the claw at the second toe of the forelimb characteristic of all but one of the megabats; and megachiropterans tend to have large prominent eyes, unlike the generally small eyes of the echolocating microbats. Furthermore, the ears of the microbats tend to have large pinnae (external ears) and the ears do not form a closed ring, but the edges are separated from each other at the base of the ear. Megabats also tend to have a diet of fruit, nectar, or pollen, only supplementing their diets with a few insects, while most microbats eat insects. Megabats range in size from species with adults only about 6 centimeters (2.4 inches) long and 13 grams to species that reach 40 centimeters (16 inches) in length, attain a wingspan of 150 centimeters (5 feet), and weigh nearly 1 kilogram (more than 2 pounds). The large eyes of most fruit bats allow them to orient visually in the twilight of dusk and inside caves and forests. The sense of smell is excellent in megabats. 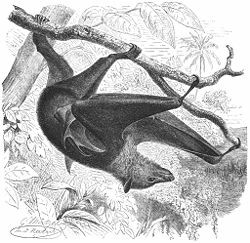 Megabats, or pteropodids (from the sole extant family Pteropodidae), are located in tropical and subtropical areas of Africa and from southern and central Asia to Australia, including in various Pacific islands, Indonesia, and the Philippines. In particular, there is a great diversity of species in Australia, the Indonesian Archipelago, and southeastern Asia (Myers 2001). Fruit bats are frugivorous or nectarivorous, in other words, they eat fruits or lick nectar from flowers. Often, the fruits are crushed and only the juices consumed. The teeth are adapted to bite through hard fruit skins. Large fruit bats must land in order to eat fruit, while the smaller species are able to hover with flapping wings in front of a flower or fruit. As seed dispersers, frugivorous bats aid the distribution of plants (and therefore, forests) by carrying the fruits with them and spitting the seeds or through ingesting the seeds and eliminating them elsewhere. Nectarivores are directly important for plant reproduction through pollinating plants they visit. They bear long tongues that are inserted deep into the flower; pollen thereby passed to the bat is then transported to the next blossom visited, pollinating it. This relationship between plants and bats is a form of mutualism known as chiropterophily. Examples of plants that benefit from this arrangement include the baobabs of the genus Adansonia and the sausage tree (Kigelia). However, there have been other views, and a vigorous debate persists to this date. For example, in the 1980s and 1990s, some researchers proposed (based primarily on the similarity of the visual pathways) that the Megachiroptera were in fact more closely affiliated with the primates than the Microchiroptera, with the two groups of bats having therefore evolved flight via convergence (Pettigrew et al. 1989). However, a recent flurry of genetic studies supports the more longstanding notion that all bats are indeed members of the same clade, the Chiroptera (Eick et al. 2005; Simmons et al. 2008). Other studies have recently suggested that certain families of microbats (possibly the horseshoe bats, mouse-tailed bats, and the false vampires) are evolutionarily closer to the fruit bats than to other microbats (Eick et al. 2005; Adkins and Honeycutt 1991). Boneia (considered subgenus of Rousettus by many authors (Wilson and Reeder 2005). Adkins, R. M., and R. L. Honeycutt. 1991. Molecular phylogeny of the superorder Archonta. Proceedings of the National Academy of Sciences of the U.S.A. 88(22): 10317–10321. PMID 1658802. Retrieved October 19, 2008. Eick, G. N., D. S. Jacobs, and C. A. Matthee. 2005. A nuclear DNA phylogenetic perspective on the evolution of echolocation and historical biogeography of extant bats (Chiroptera). Molecular Biology and Evolution 22(9): 1869–86. PMID 15930153. Retrieved October 18, 2008. Hutcheon, J. M., and T. Garland. 2004. Are megabats big? Journal of Mammalian Evolution 11(3-4): 257-277. Retrieved October 18, 2008. Myers, P. 2001. Pteropodidae. Animal Diversity Web. Retrieved October 18, 2008. Pettigrew, J. D., B. G. Jamieson, S. K. Robson, L. S. Hall, K. I. McAnally, and H. M. Cooper. 1989. Phylogenetic relations between microbats, megabats and primates (Mammalia: Chiroptera and Primates). Philosophical Transactions of the Royal Society of London Series B, Biological Sciences 325(1229):489-559. Simmons, N. B., K. L. Seymour, J. Habersetzer, and G. F. Gunnell. 2008. Primitive Early Eocene bat from Wyoming and the evolution of flight and echolocation. Nature 451: 818-821. Retrieved October 18, 2008. Teeling, E. C. M. S. Springer, O. Madsen, et al. 2005. A molecular phylogeny for bats illuminates biogeography and the fossil record. Science 307(5709): 580-584. PMID 15681385. Retrieved October 19, 2008. Wilson, D. E., and D. M. Reeder. 2005. Rousettus (Boneia) bidens. In D. E. Wilson, and D. M. Reeder (eds. ), Mammal Species of the World, 3rd edition. Johns Hopkins University Press. ISBN 0801882214. Retrieved October 19, 2008. This page was last modified on 20 October 2008, at 12:49.